Our postulant Nadya Ruzhina FINALLY was received into novitiate. Many sisters celebrated with her. Finally – she already entered in Bulgaria in 2007, but finished her course of studies first. She successfully completed her studies of Social Work in Benediktbeuern in summer 2014. Over all the years she kept up her longing for a life with Christ through all ups and downs with God’s help and the sister’s support. Her deep joy about being able to go the next step was noticeable and visible on this day, not only in her eyes. Nadya asked to keep her baptismal name. So now she’s called Sr. Nadya. The name comes from the Bulgarian word “nadeschda” which means hope. 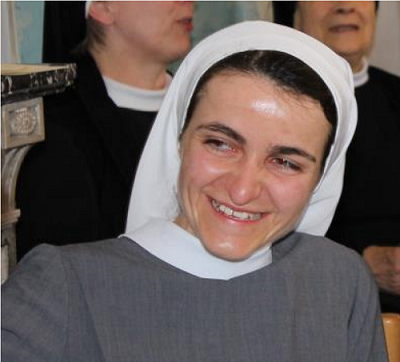 We wish Sr. Nadya for her way in novitiate that there’s no need to fear in her searching. May she experience the reason for her hope and find clarity where and how she wants to live her life in God’s kingdom.